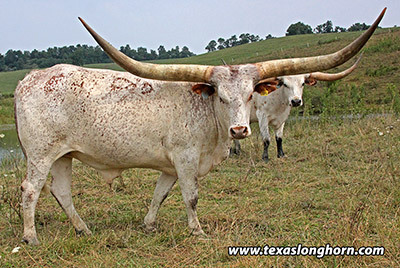 DOB: 4/30/2012; Sire: Pretoria; Dam: Beth Field; Color: Red; He is a 3/4 Watusi and 1/4 Texas Longhorn. He has the genetics to grow 100 inches tip to tip. Picture him in your front yard. The rural mail carrier will run over your mail box every day just looking at him. T2T spreat 78.5 inches on 5/25/17. He will stop more traffic than a President Trump sighting. DOB: 5/29/2012; Sire: Pretoria; Dam: High Dingo; Color: W/R Ears; His unusual salt and pepper speculation is like no other. Now you can have a one of a kind, which he is. 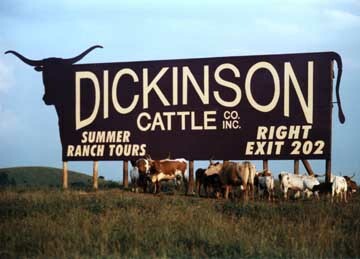 Horns T2T on May 31, 2018 is 90.38". 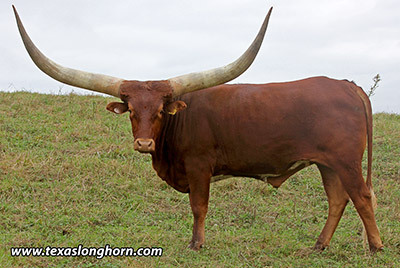 His horn tips will be wider than the First Lady is tall, but not as thick a base. He will stop fast traffic on a foggy day. 100" is projected easy in his future.